Alleviate Joint Health Formula Review | Does It Work? Alleviate Joint Health Formula Review – Is This Product Safe To Use? What is Alleviate Joint Health Formula? This is an all-natural dietary supplement claimed to enhance joint health and functioning. The formula is formulated using five ingredients both of which have been used for a long period to treat joint-related problems. The performance of this formula is said to be unique in that it deals with joint pain right from its root-core. According to the manufacturer, this formula is able to repair damaged and swollen joints as a result of inflammation. What is the Company Behind Alleviate Joint Health Formula? 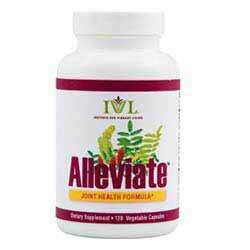 Alleviate Joint Formula is a product manufactured by IVL. This company has been in this business for a long time and has a rich history of excellence and is considered as one of the leading manufacturers of dietary supplements and vitamins in the market. What are the Ingredients Used in Alleviate Joint Health Formula? How Does Alleviate Joint Health Formula Work? The main ingredient, Hyaluronic acid acts to promote joint flexibility without causing any difficulties. When a person ages, joints start to have increased levels of stiffness on their joints. So, it’s upon this basis that this supplement is designed to help joints from feeling stiff by increasing the levels of cushioning. Hyaluronic acid is extracted from the rooster’s comb and gets completely absorbed in the body due to its low composition of molecular weight. Besides this acid, the other ingredients are also important in that they assist in alleviating joint problems. What are the Pros of Alleviate Joint Health Formula? There is lots of information about this formula in the official website. What are the Cons of Alleviate Joint Health Formula? The formula lacks the essential ingredients like Glucosamine and Chondroitin which promotes healthy joint functions. The suggested use is two vegetable capsules twice each day until you feel better. There are no clinical studies conducted on this formula. So, it the question mark remains as to whether the claims here are valid or not. Though the manufacturer does say that this formulation does not have any side effects, lack o0f any clinical study on the effectiveness and potential side effects makes it difficult to believe the claims. There could be side effects that haven’t been unearthed by lack of clinical studies. The manufacturer puts it that the formula is effective but how would it be the case without any clinical study to support the claim? Until such clinical studies have been done, it’ll be difficult to ascertain the effectiveness of this formula. Lack of scientific studies means that you need to do more research on other supplements for joint pain before considering this one. A formula without any clinical evidence cannot be claimed to be right for use. What Should I Expect When Taking Alleviate Joint Health Formula? The manufacturer claims that by taking this formula, your joint pain problems would be alleviated. Will Alleviate Joint Health Formula Show Results? Though there are a few positive results, those results were for only a short period. Majority of consumers have reported negative feedbacks. This joint formula does not have any clinical evidence to show whether it’s effective or not. The manufacturer claims that this formula will be able to show results within few weeks of usage. Alleviate joint supplement is claimed to be a good supplement for alleviating joint problems but this might not be the case. Looking at the key ingredients used to manufacture this formula, you realize that it lacks the most effective ingredients in Glucosamine and Chondroitin. These two ingredients are the ones clinically proven to be safe and effective and are present in many joint pain supplements. Further, lack of any scientific study to support the claims that this formula works to alleviate joint pain puts lots of doubt on the credibility of the claims. There are other known supplements in the market that can work better in alleviating joint pain.